Harvey is a 1944 play by the American playwright Mary Chase. Chase received the Pulitzer Prize for Drama for the work in 1945. It has been adapted for film and television several times, most notably in a 1950 film starring James Stewart. Harvey premiered on Broadway on November 1, 1944, at the 48th Street Theatre and closed on January 15, 1949, after 1,775 performances. The original production was directed by Antoinette Perry and produced by Brock Pemberton and starred Frank Fay as Elwood P. Dowd and Josephine Hull as Elwood's sister Veta. Elwood was subsequently played during this run by Joe E. Brown, Jack Buchanan, and James Stewart. The play also had a production in 1949 at London's Prince of Wales Theatre starring Sid Field and Athene Seyler then, after Field's death, Leslie Henson. A Broadway revival at the ANTA Theatre ran from February 24, 1970, to May 2, 1970, and starred James Stewart and Helen Hayes. In 1975 Stewart appeared in a West End revival at the Prince of Wales Theatre, with Mona Washbourne in the role of Veta. A further West End revival played at the Shaftesbury Theatre in 1995 starring Gorden Kaye and Rue McClanahan. The Roundabout Theatre Company production of the Broadway revival opened in previews on May 18, 2012 (officially on June 14), at Studio 54. Directed by Scott Ellis, Jim Parsons starred as Elwood, with a cast that featured Jessica Hecht, Charles Kimbrough, Larry Bryggman, Morgan Spector, and Carol Kane. 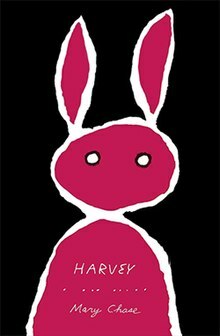 In 2015 Harvey had another short run in the West End from March 17 to May 2 at the Theatre Royal Haymarket. James Dreyfus played Elwood P. Dowd with Maureen Lipman as Veta. Elwood P. Dowd is an affable man who claims to have an unseen (and presumably imaginary) friend Harvey — whom Elwood describes as a six-foot, three-and-one-half-inch (192 cm) tall pooka resembling an anthropomorphic rabbit. Elwood introduces Harvey to everyone he meets. His social-climbing sister, Veta, increasingly finds his eccentric behavior embarrassing. She decides to have him committed to a sanitarium. When they arrive at the sanitarium, a comedy of errors ensues. The young Dr. Sanderson mistakenly commits Veta instead of Elwood, but when the truth comes out, the search is on for Elwood and his invisible companion. When Elwood shows up at the sanitarium looking for his lost friend Harvey, it seems that the mild-mannered Elwood's delusion has had a strange influence on the staff, including sanitarium director Dr. Chumley. Only just before Elwood is to be given an injection that will make him into a "perfectly normal human being, and you know what bastards they are!" (in the words of a taxi cab driver who has become involved in the proceedings) does Veta realize that she would rather have Elwood the same as he has always been — carefree and kind — even if it means living with Harvey. But the only reason Veta hears from the cab driver is that she can't find her coin purse and has to get the cab fare from Elwood. That is when the cab driver sees what is happening and goes into his spiel. Later Veta realizes that the purse was there all along, but Harvey hid it from her. The only character to appear in all scenes is Elwood. Universal Pictures acquired the film rights for a then record $1 million and the play was adapted for film by Chase, Oscar Brodney, and Myles Connolly in 1950. Directed by Henry Koster, it starred Josephine Hull (who won an Academy Award for her performance) and James Stewart. The first, in 1958, starred Art Carney, Marion Lorne, Elizabeth Montgomery, Larry Blyden, Fred Gwynne, Charlotte Rae, and Jack Weston. In the second, James Stewart reprised his screen role in 1972 along with Fred Gwynne, Richard Mulligan and Madeline Kahn. The last, in 1998, starred Harry Anderson, Swoosie Kurtz, Jessica Hecht (who appears in the 2012 revival), Leslie Nielsen, and William Schallert. In addition, versions of the play were produced for West German television in 1959, 1967, 1970 [de] (with Heinz Rühmann) and 1985 as Mein Freund Harvey (My Friend Harvey). Elwood was played by Donald O'Connor, who had made his Broadway musical debut earlier the same year in another mistake, Bring Back Birdie. As Elwood's sister, Veta, Patricia Routledge gave another superb performance in a bomb; after (this show) she washed her hands of the American musical theatre... (it) opened up a two-set play to include scenes in the bar only described by Elwood in the play and brought on an extraneous chorus for numbers like the opening "Smalltown U.S.A." In between the songs, Chase's original play still shone through. On August 2, 2009, it was revealed that Steven Spielberg had committed to a new adaptation of the play, to be a co-production between 20th Century Fox and DreamWorks, with a screenplay written by Jonathan Tropper. However, on December 4, 2009, Spielberg revealed that he had quit the project, partly due to his inability to find an actor willing and able to play Elwood Dowd. In May 2012, a new production of the original play began previews in New York City at the Studio 54 Theatre, starring Jim Parsons, Charles Kimbrough, Jessica Hecht, Larry Bryggman, Morgan Spector, and Carol Kane. The Roundabout Theatre Company production ran June 14–August 5, 2012. Theatre review aggregator Curtain Critic gave the production a score of 73 out of 100 based on the opinions of 15 critics. ^ "Harvey". Internet Broadway Database. Retrieved 2015-11-24. ^ "Harvey". Playbill Vault. Playbill. Retrieved 2015-11-24. ^ "Prince of Wales Theatre London". Thisistheatre.com. Retrieved 30 April 2015. ^ Catholic Herald archive, catholicherald.co.uk; accessed January 1, 2013. ^ "Harvey to return to West End starring James Dreyfus?". West End Theatre.com. West End Theatre.com. Retrieved 30 April 2015. ^ Jones, Kenneth. "Harvey, Starring Jim Parsons in Classic Hare-Raising Tale, Begins Broadway Run", playbill.com, May 18, 2012. ^ Harvey at Theatre Royal Haymarket in London. Accessed 21 March 2015. ^ "Goldwyn's Top Price For 'Guys and Dolls' Musical $1,000,000 Against 10%". Variety. March 10, 1954. p. 4. ^ Lowry, Brian (2009-08-02). "BFDealmemo". Weblogs.variety.com. Archived from the original on January 30, 2010. Retrieved 2010-07-06. ^ IMDb reference to Spielberg's Harvey; accessed May 27, 2014. ^ "Harvey". Curtain Critic. Retrieved June 21, 2012. Wikimedia Commons has media related to Harvey (play).